One idea I am working on at the moment is that, rather than as a monolith or even a hierarchical pyramid emanating downwards and outwards from Moscow, global communisms may be seen as cogwheels which together formed a decentralised and multipolar ‘machine’ (at least during the Cold War). In place of the traditional conceptualisation of information and leadership flows as hierarchical and linear (or, in a more sophisticated sense, multilinear), the interaction of these ‘global communisms’ worked more like a series of inter-related cogs of varying sizes. 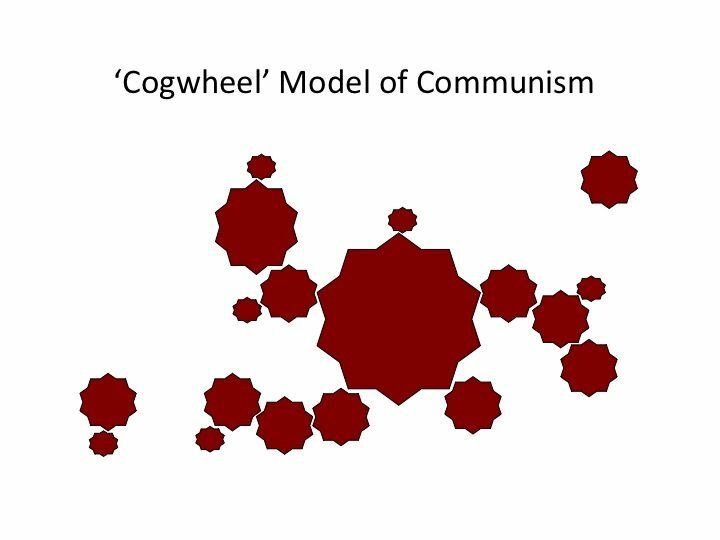 Sometimes these cogs were driven from the centre, sometimes from the periphery, and sometimes a breakdown in the system would see a single cog (Yugoslavia, for example) or an entire sub-system (the Chinese-dominated variants of communism) spin off and form a new ‘machine’. To extend the metaphor: sometimes external ‘spanners’ were thrown into the works; sometimes the cogs worked against one another; sometimes the teeth of the cogs simply wore down. 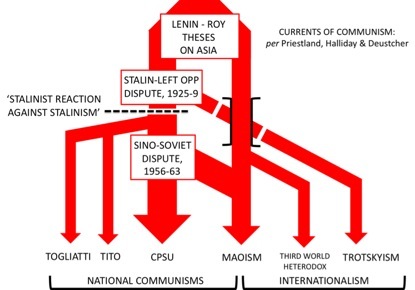 Here’s how I currently visualise the main currents of communism from Lenin up to around the 1950s/1960s. The next major addition will be the dissident strains caused by the Hungarian and Czech ruptures, the development of Eurocommunism, and the fragmenting of East and Southeast Asian communisms. This visualisation draws particularly on the work of Isaac Deutscher, Fred Halliday and David Priestland.